P Series readers are to be used with Paxton Swtich2 and Net2 systems and come with the choice of black or white fascias. The readers read a token when the token is held within close proximity. When a token has been read the controller looks up all the access permissions of that user and either grant or denies access. If access is granted a green LED flashes however if access is denied it will then flash red LEDs. 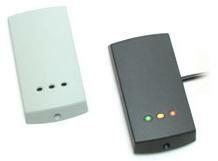 In order to find out more about our range of Paxton Access control solutions, call us on 0800 9882434.